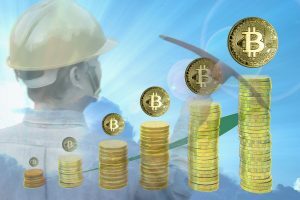 In this article, we investigate the profitability of engaging in bitcoin cloud mining activities. 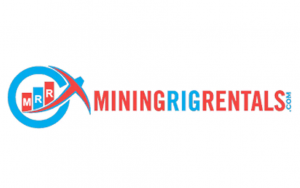 The aim is to go through the bitcoin cloud mining industry, mining difficulty and provide real results. We also analyze the bitcoin market in terms of its value, networking, and infrastructure. Combined with contracts offered by the cloud mining platforms, we also compare the cryptocurrency with other altcoins. Throughout this article, we benchmark bitcoin with other digital money, such as Ethereum, DASH, Litecoin, Zcash, and Monero. To understand the attractiveness of bitcoin cloud mining, it is important to start with the coin itself. BTC is the pioneer of the cryptocurrency world, developed by an anonymous developer(s) called Satoshi Nakamoto in 2009. Since its creation, the digital coin built itself an impressive network of exchanges, mining operations, and infrastructure. The algorithm used for mining BTC is called hashcash algorithm, enabled through Proof of Work (PoW). The said algorithm allows blocks to be awarded to blockchain participants as they solve difficult mathematical problems. Through work on these equations, miners use equipment that would give quick solutions and hashes a block. 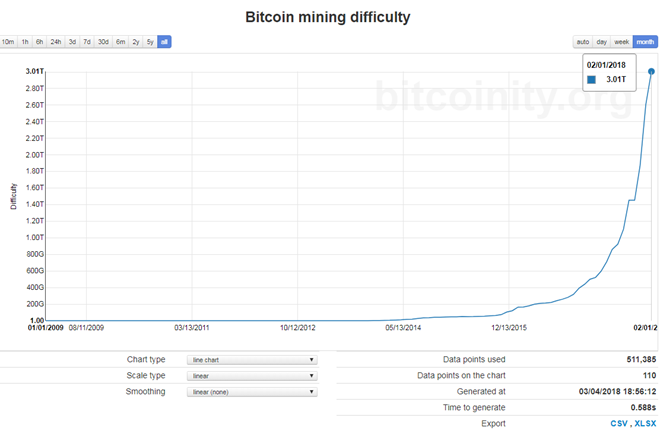 Using chart from Bitcoinity, it is evident that mining difficulty of bitcoin rose tremendously in recent years, starting from 2015. Taking a look at the chart below, it is also evident that, with the rise of its popularity, the difficulty will only go up at this point. The same can be said for all other coins that we investigate for cloud mining, Ethereum, DASH, Litecoin, Zcash, and Monero. Out of them, Ethereum is the closest one to bitcoin, both in terms of volume and mining difficulty. There is also an issue that other coins do not have and that is halved mining block award. Bitcoin just recently halved its block reward from 25 bitcoins to 12.5. On the other hand, bitcoin is supreme to all other coins, most of the time even affecting their value. At this point, bitcoin has almost 16.9 million coins in circulation, worth of $188 billion. Its price followed its difficulty more or less, though it fluctuates greatly, as seen in the chart below. When designing your own cloud mining profitability calculator, it is important to take several factors into account. The first is its price and market availability when selling it in exchanges. Bitcoin, being the leader of the crypto pack, does not have any issues regarding supply. You can sell it in all large cryptocurrency platforms, such as Bitfinex, Coinbase, CEX.IO, Bitstamp and many others. The price greatly fluctuates, though it has experienced a sharp increase at the end of 2017 and beginning of 2018. Then it fell down from almost $20.000 to now $11.000 (approximations). Now, it stagnates in its value stability for some time. With planned forks and improvements, the coin can go either way. Its value might fall or rise, depending on the market trends. Next in line is mining difficulty, as you need to calculate daily payouts to you by the cloud mining platform. Most cloud mining platforms pay you out in BTC on daily basis, depending on that day’s mining difficulty. At last, you need to take into account the price of the contract offered to you, which is the main determinant of how profitable the cloud mining platform really is. But, when compared to other coins, bitcoin now probably is not the most profitable coin. 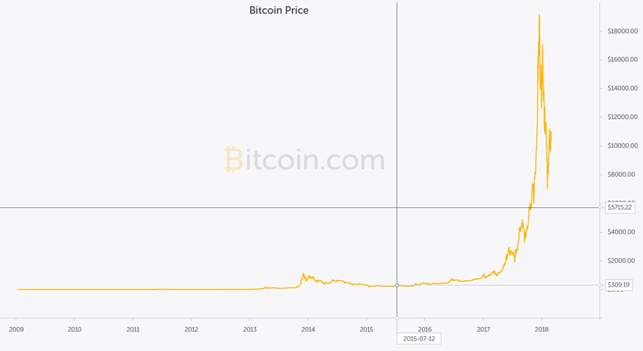 Its value is stable and the price is not really growing as it did a few months ago. If the price stagnates or even goes down, you might even end up with a loss, rather than make a profit. The same situation is seen with other coins, as they all follow BTC when price changes start hitting the market. In terms of contracts, most platforms offer two types of plans for its clients. One is the limited time program, usually lasting between a year and two years. The other type is unlimited in time, as you purchase the contract and cloud mine with it until company deems a change is needed. The first one is guaranteed that you have a certain period in which company will not break the arrangement. In the other, although potentially has better profit margins can be cut down anytime by the company. It is thus important to understand the company itself and what kind of reputation it has. Pretty much all cloud mining providers offer plans for BTC. 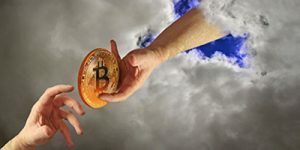 In this article, we briefly go over the most popular choices for BTC cloud mining. The chosen platforms for this article are Genesis Mining, Hashflare, and Hashing24. Founded in 2013, Genesis Mining is the leader of the cloud mining pack, with its mining operations based in Iceland. 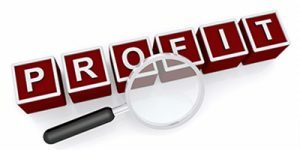 The team behind the platform came up with three plans for clients to choose from. Bitcoin plans at Genesis Mining have a maintenance fee of $0.00028 per GH/s per day, paid in bitcoins. Plans themselves are presented in the picture below and they last for 2 years. Hashflare is also arguably one of the largest Cloud Mining providers in the industry. The bitcoin cloud mining is represented in a customizable plan where 10 GH/s are priced at $1.80. Here also apply maintenance fees, standing at $0.0035 per 10 GH/s. These costs are paid in bitcoins on a daily basis while contracts last for a year only. You can check out the said plan in a snapshot below. Hashing24 is yet another cloud mining that offers plans invested in BTC mining. 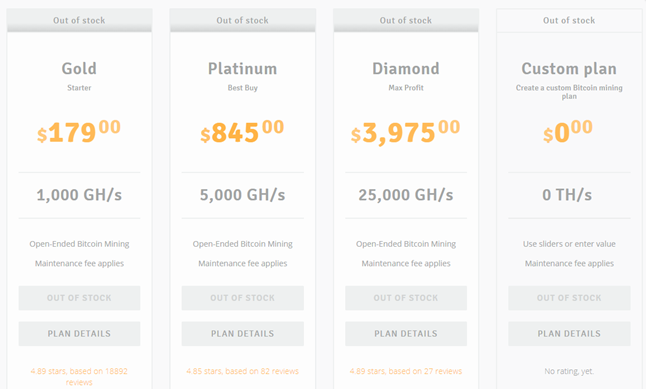 In fact, bitcoin is the only one offered at this platform, at the price of $68.50 for 100 GH/s. The said plan is customizable in terms of speed and comes with a maintenance fee of $0.00033 per GH/s per day. Contracts last for 3 years. In this bitcoin cloud mining review, we went over the attractiveness of its cloud mining for investors. The coin, although the leader in the industry, has issues with mining difficulty and fluctuating value. Most of the platforms employ maintenance fees, making it somewhat less profitable than other coins.